Legoland Florida officials held a media presentation and hard hat tour yesterday to answer the three questions they are most often asked. What’s going to be in the park? Legoland Florida General Manager Adrian Jones not only gave the answers, but he did so in detail. Here’s a look at his presentation. 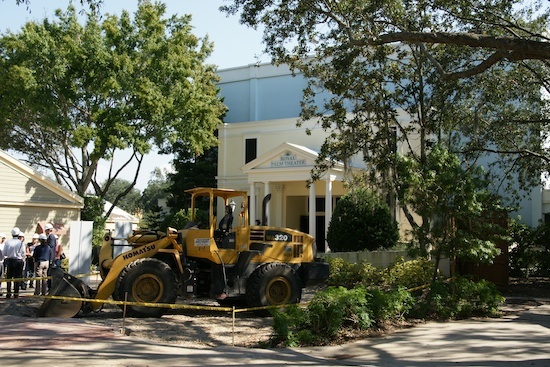 Although not much has been done to the old Cypress Gardens property just yet, they plan on opening the 150-acre theme park next October, 2011. “With exactly one year until we open, the countdown really begins now,” said Adrian. 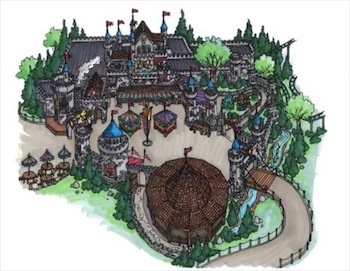 The 10 lands in the park will feature more than 50 interactive rides, shows and attractions. The lands are The Beginning, Fun Town, Miniland USA, Castle Hill, Land of Adventure, XTreme, LEGO City, Imagination Zone, Pirate Cove and Duplo Village. Unlimited admission plus food and merchandise discounts and free parking. Lifetime admission to Legoland Florida, free preferred parking, special events admission, and discounts on food and merchandise. 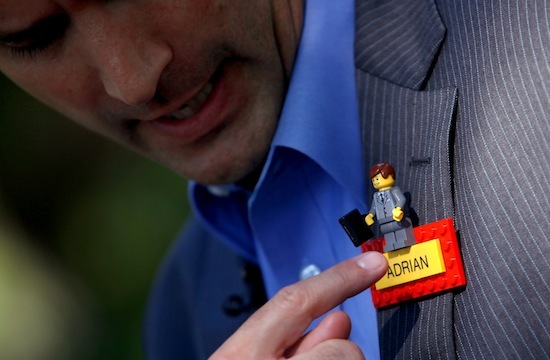 In keeping with the trading craze at many theme parks, if guests see a Model Citizen employee with a mini-figure on their name tag, they’ll be able to trade them for one of their mini-figures. Another often asked question was answered again yesterday. Yes, the Botanical Gardens will remain and the Southern Belles will be represented in some way. • The Market – Authentic imported Danishes and freshly baked pastries, espresso, milk, juice, fruit, a selection of yogurts and soft serve ice cream. 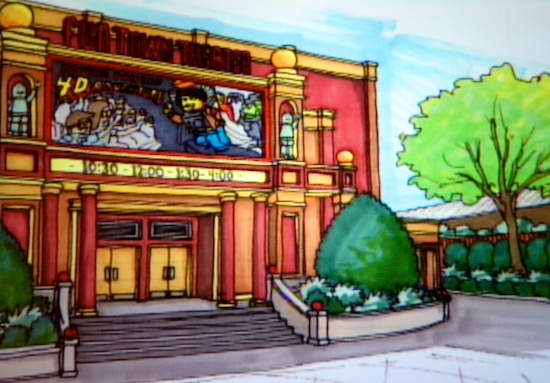 Fun Town will feature a variety of retail shops and treats, most notably, Granny’s Apple Fries. • Factory Tour – A firsthand look at how Lego bricks are made from factory to finish. • Studio Store – Pick-up all your favorite Lego licensed products, like Clutch Powers, Bob the Builder, SpongeBob, Indiana Jones, Star Wars, Harry Potter and Batman. 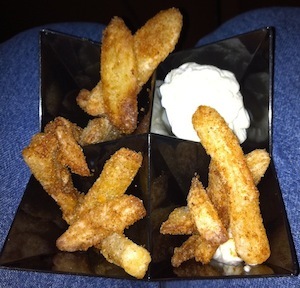 • Granny’s Apple Fries – This Legoland-famous snack is made with crisp Granny Smith apples, powdered with cinnamon and sugar and served with a sweet vanilla cream sauce. • Fun Town Theater – Four different 4-D movies will show throughout the day at Legoland’s largest 4D theater with seats for 700. • Florida encompasses the entire state from Mallory Square in Key West to Bok Tower Gardens in Central Florida and antebellum mansions in the Panhandle. 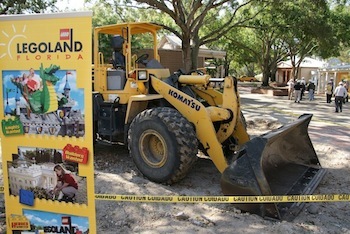 Miniland Florida also includes an expanded area for Kennedy Space Center and an interactive Daytona racing experience where guests can race Lego brick cars. • Las Vegas features the Strip including the Luxor, New York, New York Hotel and Casino, Excalibur, Mirage, Treasure Island, Tropicana, MGM Grand, Venetian, Stratosphere tower and two iconic structures of Paris Las Vegas: the balloon sign and Eiffel Tower. “The Strip” also features a miniature wedding chapel, monorails and real life sounds recorded in Las Vegas. The architectural landmark is built out of more than two million bricks and represents more than 16,000 hours of creative artistry. • Washington, D.C. sports faithful recreations of the White House, Capitol Building, Smithsonian, Washington and Jefferson monuments and parts of Georgetown. An animated marching band parades in front of the Capitol and tiny cherry trees blossom every spring. • New York City features the Freedom Tower years before its completion in the Big Apple. Tiny jets of water shoot up from the fountain in Rockefeller Plaza, while an army of animated yellow taxicabs prowls the streets of Times Square. The Statue of Liberty, a cutaway view of Grand Central Station, The Empire State Building, The Guggenheim Museum and the Bronx Zoo are just a few of the recognizable landmarks. • A Pirate themed section hosts a full-on swashbuckling pirate adventure as two opposing pirate ships and their “mates” battle it out upon the high seas. • The Dragon – An indoor/outdoor steel roller coaster that features a spirited and humorous view of life behind the scenes within the enchanted Legoland Castle. • The Royal Joust – Kids ride Lego-themed horses through a number of medieval scenes where they encounter other riders in a simulated joust. In Land of Adventure, all ages explore hidden tombs and hunt for treasure. • Coastersaurus – This junior wooden coaster reaches curves and dips in and around a prehistoric jungle of animated and life-sized Lego brick dinosaurs. • Lost Kingdom Adventure – A dark ride that invites guests to fire laser blasters at targets and brave the rugged Egyptian landscape in all-terrain roadsters, while attempting to unearth the vast treasures of a forgotten empire. •	Pharaoh’s Revenge – This outdoor attraction lets children and parents fire soft foam balls at enemies and explore the complex maze of the Pharaoh’s kingdom. • Beetle Bounce – Launch 15-feet up toward brightly jeweled Lego scarab beetles perched atop two monumental obelisks. XTreme is where some of the pink-knuckle thrills can be found. • Lego Technic Test Track – Brave guests feel the power of acceleration, braking and maneuverability as they race a life-size Lego Technic vehicle along a roller coaster track. • Aquazone Wave Racers – Riders zip in and out of waves as they dodge water blasters on this dual water carousel ride. Lego City is the place where youngsters can live out their dreams in a scaled down town created just for them. • Fun Town Fire Academy – Families race to put out a “blaze” by piling into a “fire truck” and power it by pumping levers across a paved straightaway. The first family to put out the fire and make it back wins! • Driving School – A “real-life” driving experience for children ages 6 through 13, where kids receive their official Legoland driver license. • Junior Driving School – A scaled down version driving school course for children ages 3 through 5. • Flight School – An inverted steel coaster that lets kids feel the thrill of flight. • The Big Test – This interactive show uses acrobatics, music and fun to teach fire safety as the zany crew of Fun Town Fire Department attempts to conquer the “Big Test” to become official firefighters. • Game Space – Features 13 game stations where guests can experience family-friendly lego video games. • Build & Test – Build a Lego car and test it against the competition on the digitally timed track. • Lego Mindstorms – Build and program computerized robots. • Lego Clubhouse – Kids and parents stock up on bulk Lego bricks and Make & Create kits while enjoying ice cream, popcorn, beverages and snacks. • Kid Power Towers – Kids and parents alike hoist themselves up to the top of a tower to get a view of the entire park and the lovely Lake Eloise, and then enjoy a “free-fall” to the bottom. Pirate’s Cove has been taken over by swashbuckling pirates along the shores of Lake Eloise. This is where guests can watch a live-action water stunt show. Duplo Village is ideal for toddlers. Youngsters can fly a plane, drive a car or explore a whole town – all designed with their height in mind. 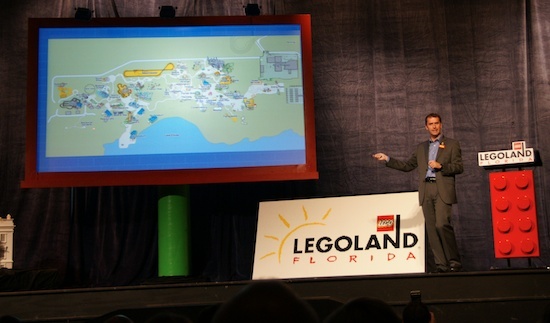 Here’s a look at the Legoland Florida map as it was presented in the presentation. Click on it for a larger view. Hola amigas! Soy un apasionado de los juegos clasicos, pero las versiones que juego on line no me gustan mucho, o no van bien con mi Debian. Podrian informarme de algun ROM que funcione bien para mi OS? Gracias y enhorabuena por el Blog! !